A few years ago I viewed a technique similar to crazy quilting.... but you could use very small scraps. there was no foundation. I remember you add any size or shape piece and then cut seam straight with 1/4 inch seam... (hope this explains it so someone will recognize it). Can't remember the same of the technique. Can anyone help? Is it called crumb quilting? I think you can sew any size pieces of fabric and any color together. Crumb cake? There is a quick tutorial on how to do crumb quilting. It appears to be what you were asking about. 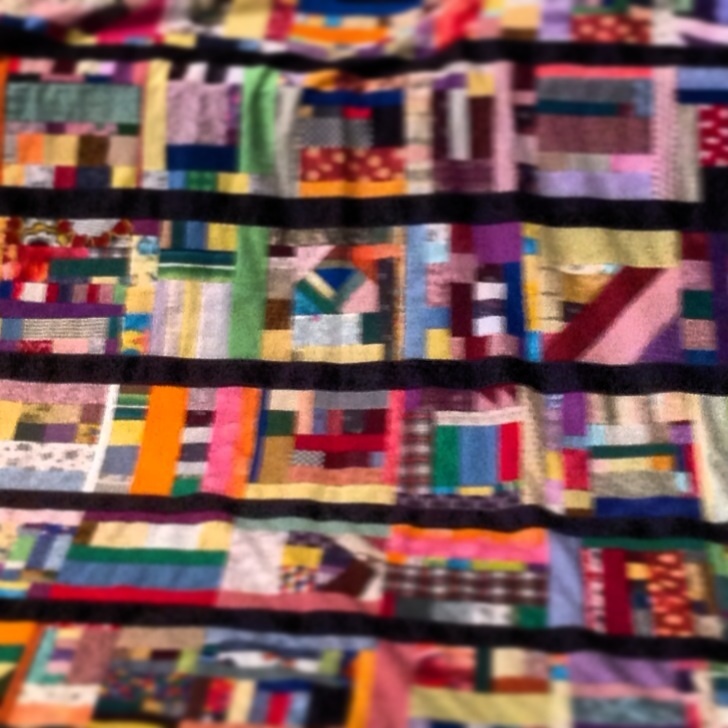 Here is one of my crumb quilts that has not been quilted yet. Looks like you had fun making this one. I want some fun too. When making these quilts, you can add any color, any shape, any size. I add leftover small blocks, HST, and flying geese. I just might name this one Anything Goes. I've made several confetti quilts: Start with strips of trash fabric as long as you want your quilt, and from 2 to 5 inches wide. Old well-worn bed sheets, bed skirts, light weight fabric you really don't like, etc. work well for this. Even worn out clothing. Piece them as needed. I usually overlap instead of seam. Lay a piece of scrap at the top of each strip. (I usually work with about 4 or 5 strips at a time. Smaller scraps go on narrower strips. Or these pieces can be pieced also.) Lay your second small piece or "pieced" piece face down over first piece. Be sure this has one straight edge at the seam line. Make a straight seam and press it back. Seams go any diredtion. Keep adding one piece to each strip so you can chain stitch. Untangle when you need to. Then just sew all the strips together until you have it as wide as you want. The one on my bed is one I was not too fond of when I made it, but it grew on me. I love it more each year. It has every color in the rainbow in it. I also made one that used all the blues in the scrap bucket. The next one I'm making has black pieces. How else are you going to use up those little black pieces? Last edited by maviskw; 07-30-2013 at 05:25 AM. They do turn out to be very pretty. I might entertain the thought of making one. Right now I am trying to use up larger pieces of fabrics and larger scraps. Seems a waste to worry about using tiny pieces when I have so much larger pieces. Omg, now I'm going to want to save all my tiny scrapes. I just barely stopped saving dryer sheets.